We were shuttled to the distillery by the Highland Park minibus. Once there we were first treated to a short film showcasing the history of the distillery (I hazard a guess that this is part of the standard tour as well). 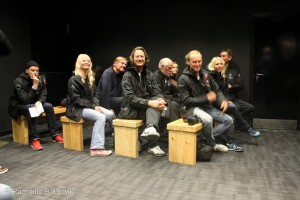 We were then split into two groups, Martin showing one around, Patricia the other. Waiting for the film to start. The tour started in the maltings, naturally. 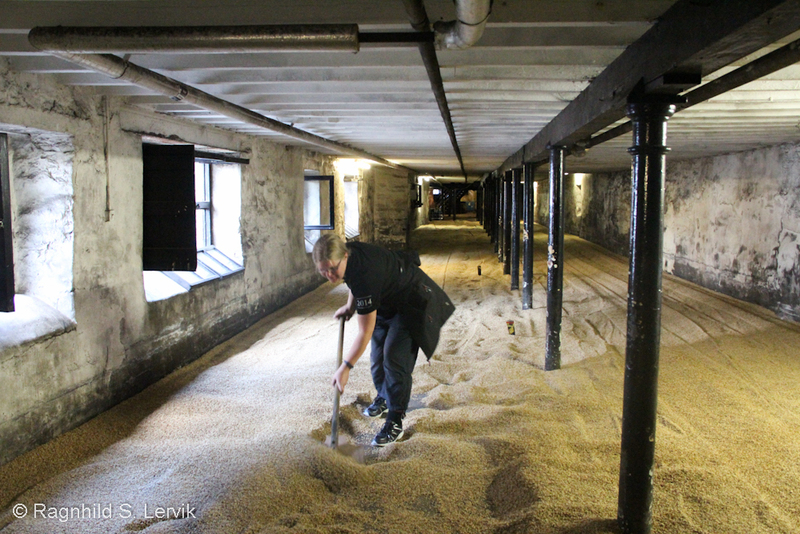 15000 tonnes of barley are malted at the distillery each year, which is around 20% of the barley they use overall. The barley variety is Concerto, and it is all “imported”, that is from mainland Scotland, which adds to the expenses, obviously. The malt must be turned. 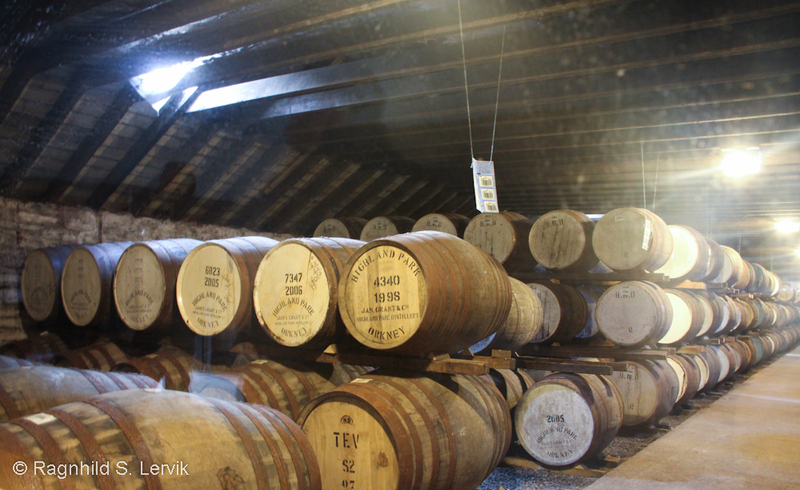 When the malt is carried from the malt floor to the kiln it has around 40% water content. It is then dried with peat for 22 hours, and then hot air until done. 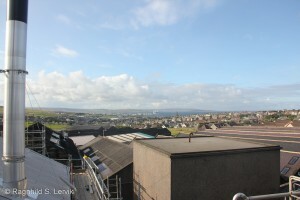 While the malt has 35-50 ppm after kilning, there is only about 2 ppm in the newmake. 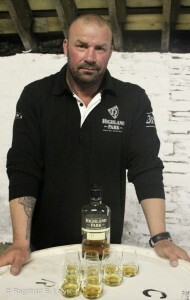 Highland Park have 12 washbacks, some Oregon Pine, some Douglas Fir and some Siberian Larch. 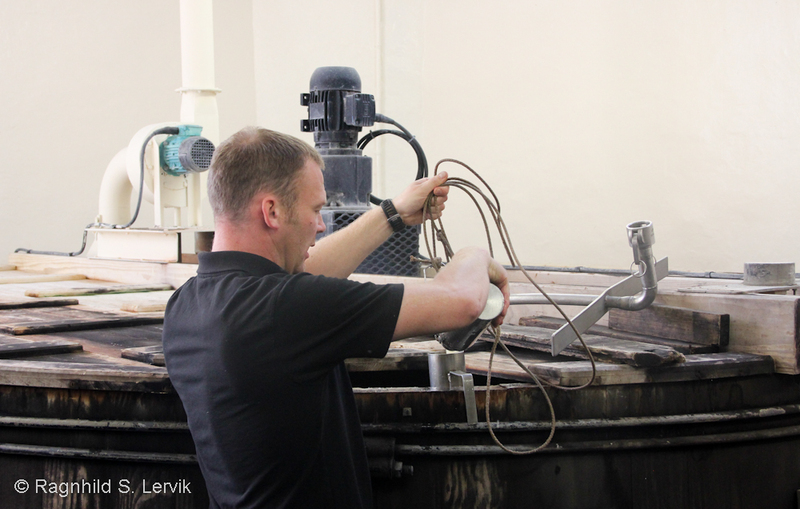 The wash is left to ferment for a minimum of 56 hours, and the resulting alchohol strength is 7-8% ABV. The wash is fruity, sweet, nutty and smokey. Wash being extracted for our tasting pleasure. 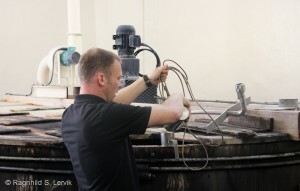 2 wash stills produce a low wine of 25% ABV, 60% of the volume is lost in the process. 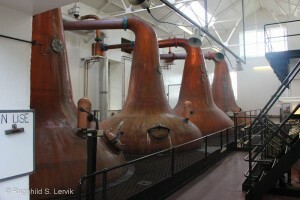 “Smells like mushroom soup in the stillhouse”, according to Patricia. We had to take her words for it, because we were not allowed into the stillhouse (they were working in there, you know), we had to content ourselves with standing at the door looking in. Ah, well. They cut from head to heart at 75% and again at 63%, which gives around 4500 liters of newmake from 30,000 liters of wash.
Lovely stills, all in a row. 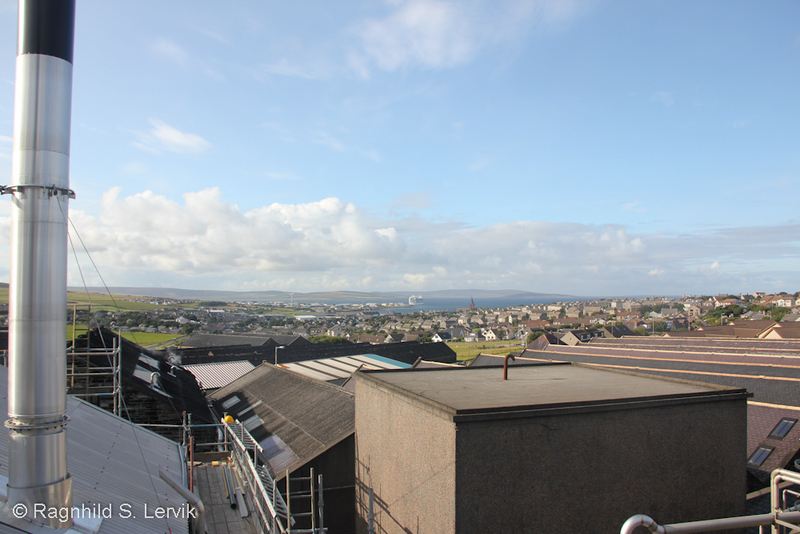 To make up for not getting into the stillhouse, we got to climb onto the roof and admire the view. 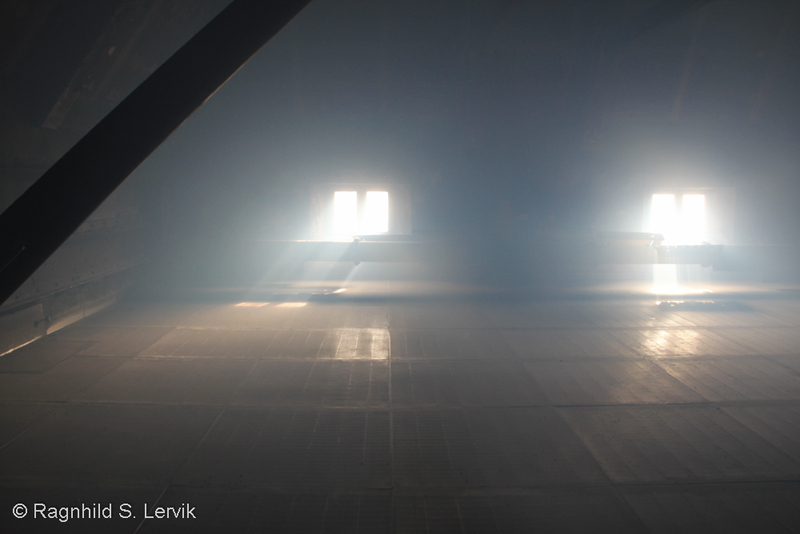 We also got to see the inside of the kiln, the floor where the malt is dried. And we got a peek into the kiln they had lit for our benefit (so we could see the fire and practice adding peat). It was empty, but the smell was rather lovely. Get in here to be marinated in peat smoke. Then it was time to climb back down to the ground to enter the hallowed halls of the warehouses. 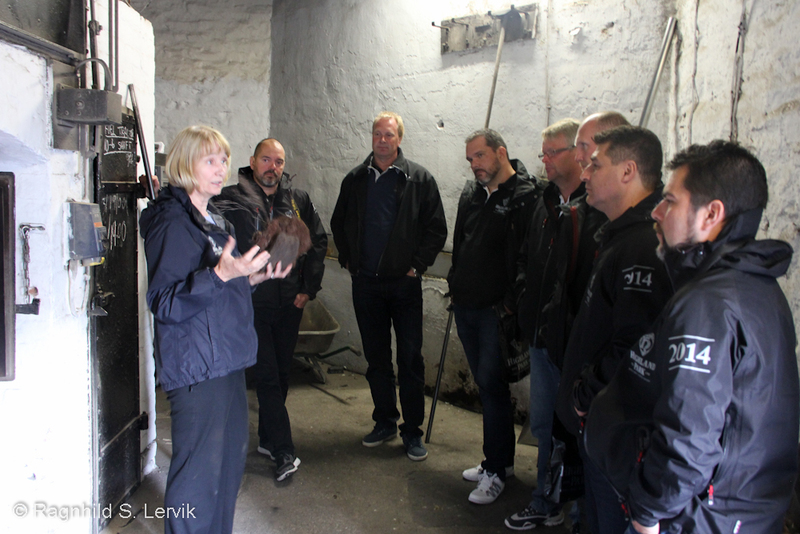 The tour was naturally concluded with a tasting, led by Martin. 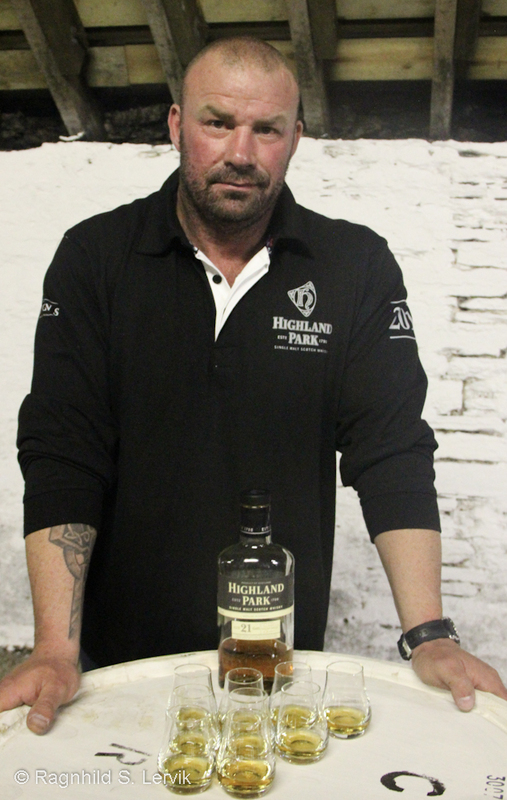 He had selected two Viking-related bottlings; Leif Eriksson and Drakkar, followed by Dark Origins, the raison d’etre for the trip, and then we were treated to Highland Park 21 years old. Follow the links for tasting notes for the others, I’ve published notes for Dark Origins before, but on this occasion I noted sherry, burnt rubber, singed popcorn and orange peel on the nose, singed casks, dried fruits and vanilla on the palate. 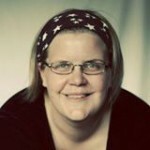 And I still like it. Contented (and exhausted, we had only arrived the same morning after all) we ended our tour with a visit to the distillery shop.